"I know what I want to get Bumder for his birthday." "A speaker thing for his iphone. It's really good and really loud but it costs €200." "WHAT?! No. Find something else." This was the conversation Gregory and I were having about Mr. London's birthday present (Gregory calls Mr.London, Bumder). I'm not making any of it up, Gregory actually wanted to spend €200 on his bumder's birthday present. ABSOLUTELY RIDICULOUS, especially if you consider this anniversary present disaster. We ended up buying him a poker table top (well Gregory did) which considering they love playing cards together was quite a thoughtful present (again, please read this post about my anniversary present to understand why Gregory's thoughtfulness and thoroughness in regards to Mr.London's present left me stumped). And another one of Mr.London's friends bought him a nifty pair of glasses which I decided to steal for myself. Unfortunately for Mr.London, he had to work on his birthday, so we thought it would be nice to go and cheer him on while he and the rest of the club battled Bayonne on his special day. Sometimes I wish I could use the exercise bike while I'm watching the match too. I for one never pass up an opportunity to multitask. 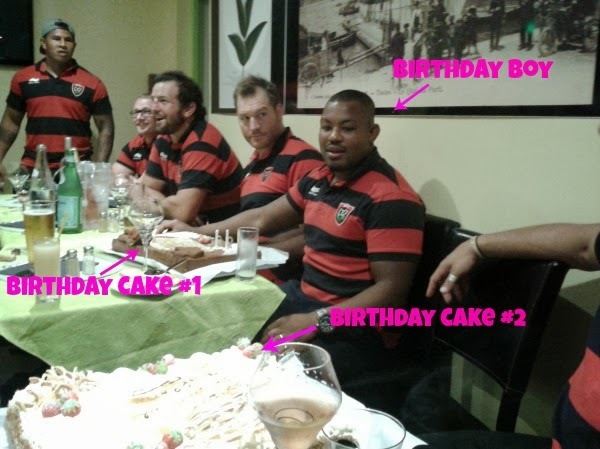 After Toulon's victory (HAPPY BIRTHDAY TO YOU MR.LONDON!) we walked back across to the port and upon seeing a ferry boat docked and all lit up, I did a little happy shimmy (makes me feel like I'm on vacation even more). I tried to capture it for you guys so you too could feel my excitement, but unfortunately, photography is not my friend. All of Mr.London's friends were there to help him blowout his birthday candles on not one, but two birthday cakes! And bonus, they were all wearing matching outfits which is pretty much cuteness overload. I got to talking with a new player from New Zealand and all the while had a niggling feeling that I knew him from somewhere, and then, after a couple of minutes it dawned on me who he was... he played in this match during the last Rugby World Cup that had made me really angry, like Incredible Hulk angry. And I remembered him in particular making me really angry, so in a very un-ladylike, un-Sara Louise manner, I turned to him in mid-conversation and said, "Hey - I know who you are! And I don't like you!" How's that for lovely, ladylike behavior? Personally, I blame the parrot. P.S. Just in case any of you are worried that I set off an international incident (because you know that's something that could happen to me... Next on the 10 o'clock news, an American woman in France was arrested late last night after starting a bar brawl when she attacked a Kiwi man), he thought it was funny. Two cakes?! : ) I will hint about that to my husband for my birthday. Two different cakes would please my gemini cake choosing part of my personality. Ask him for a parrot glass set next birthday cos they are awesome! You get to have all the fun, no fair. A poker table is a thoughtful gift. Those mojitos look pretty epic, as do the Mad Hatter purple seats in the background! You're so lucky to be so close to the sea. How can it not feel like a holiday especially with the gorgeous color of that water! Oh and from wife to wife, yeah, I agree, 200 euros for a birthday gift is a bit steep. Good call, Madame! Oh, that Parrot glass is a thing of wonder!! I want one!! Failing that, I want to join you for one at the port! Sensibility goes out of the window when it comes to my hubby's bromances too...think it's a man thing. Still....foot spa? "Bring on the cabana boys!" :o) You crack me up! I wish my friends spent €200 on me for my birthday! Your husband might be generous to a fault. I swear, their bromance just keeps getting better with time. Haha - go figure a guy wanting to buy a bro a 200 euro set of speakers after buying his wife a foot spa! Classic! Sounds like an epic birthday celebration... and it also sounds like you're friends with a lot of professional rugby players! Who was the player from New Zealand... they are so easy to love and hate all at once ;) My all time rugby nemesis though...Quade Cooper... the Aussies take it for this one. What do you mean? You captured the shimmy perfectly. We do not need to name and shame the EX AB you are talking about but I could not agree more he hated everything French but my goodness very willing to take the Toulon Money Best wishes as always for ASM they are still so special I live in Christchurch New Zealand. I do love reading about your adventures - you could make a stroll in the park sound absolutely wonderful! It seems you have the gift of enjoying life to the full. I don't even drink mojitos, and I'm desperate for a parrot mojito glass. I could serve milk in it, right? Happy birthday, Mr. London. Thanks for leaving that nice comment on my post about Naples. I love my new bag, it makes up for the pizza lol. Looks like it was sooo much fun! You look fantastic with these glasses! Also, AMEN to multi-tasking....like can I please hook a bike up to my desk where they keep me chained for 10 hours a day?! And I think that you should always wear those glasses....neon green is your color.